While visiting Dublin 2018, Sr Maureen Coyle snd visited The National Museum of Ireland. 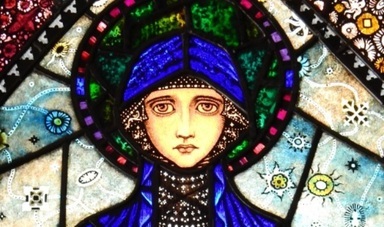 There in all its splendour and glory, glistening and sparkling in the New Wing is the magnificent three light stained glass window “ Mother of Sorrows “ by the deceased famous Dubliner Harry Clarke. 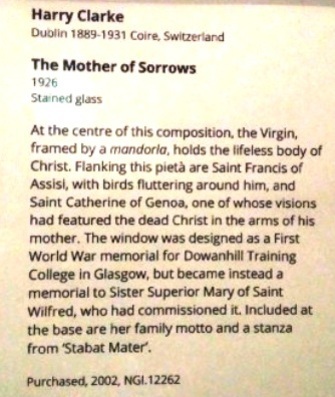 The Window which once was in the Convent/ College Chapel of Notre Dame, Dowanhill, Glasgow, Scotland was sold by the sisters in 2002 to the museum, where it was stored but is now on permanent display since June 2017. 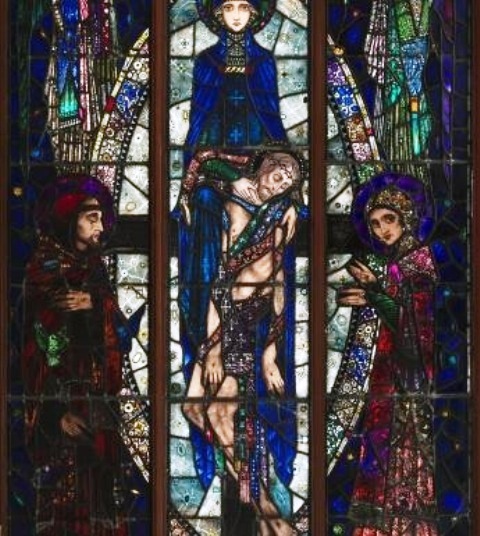 This masterpiece of Harry Clarke’s was originally intended to be a memorial to World War 1 but sadly became a memorial to Sister Mary of St Wilfrid, the College Principal who commissioned it, and who sadly died in 1926. The Left Light of the window depicts St Francis of Assisi, bare footed and wearing a simple brown garb with birds fluttering around him. The stigmata in his hands is clearly on view. Angels adorned in red hats and green gowns stand above him. The Right Light of the window shows St Catherine of Genoa, who also bore the stigmata! Catherine is dressed in beautiful finery with a little cap on her head which is in keeping with many women in Clarke’s art. She is depicted in magnificent robes of magenta, purple, ruby, and gold with emerald sleeves. She too stares out at the viewer as if to encourage one to contemplate the scene. Again two angels in stunning attire stand above Catherine. 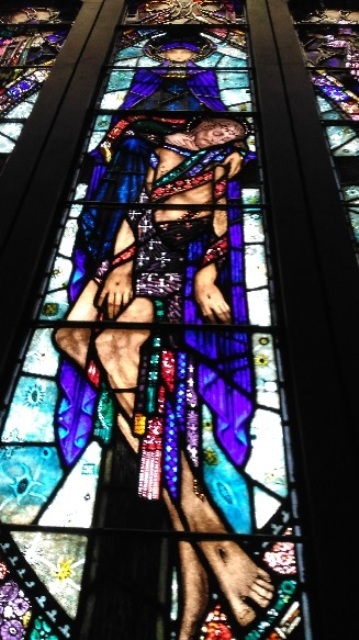 In its new surroundings, the Window, in a room with Irish Stained Glass, commands the attention of the viewer. 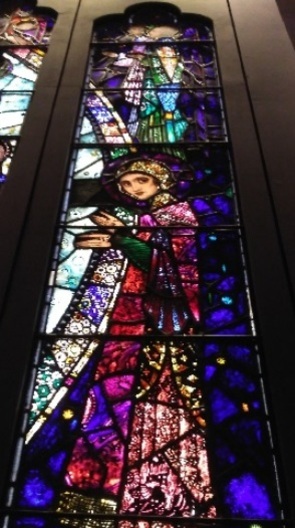 The Middle Light shows the Virgin Mary in true vibrant blue, associated with Clarke. She is gazing with huge eyes out at the onlooker. With bent knee, Mary, leaning on the cross bar supports the dead limp body of her Son. Her hands clearly enfold the body which is encrusted with many coloured stoles designed with crosses. 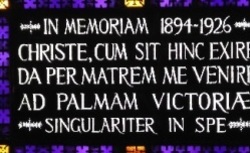 At the bottom of the cross are the Latin words from a verse of ‘Stabat Mater’. Sr Mary of St Wilfrid's family motto ..... ‘Singulariter in Spe'. (Firmly Established in Hope.) is recorded at the bottom of this Pieta. 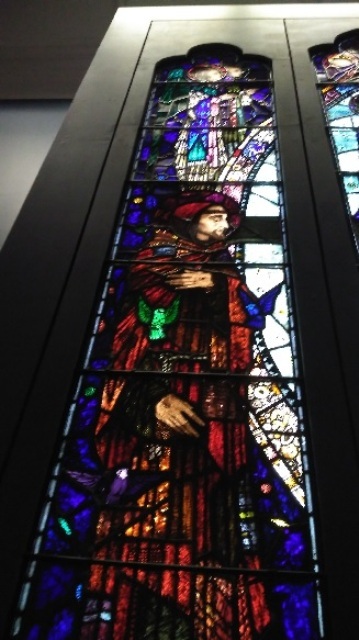 Part of Notre Dame’s Past is recorded in the beauty portrayed in this work of art displayed in this magnificent Window which now is resplendent in its homeland where it was created. 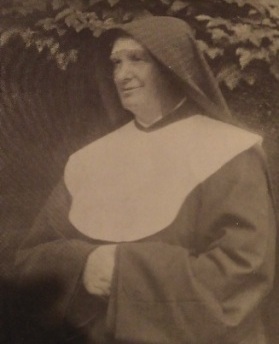 The devotion to the victorious cross was prominent in the life of St Julie Billiart, foundress of the Sisters of Notre Dame de Namur. Written by Maureen Coyle snd.